Does your home smell musty, has bubbling paint and flaking plaster? These are commone effects of Rising Damp. Aside from making your home seem cold, Rising Damp often causes mould. Valued at $385. Free For a Limited Time. What happens if Rising Damp is left untreated? Ignoring Rising Damp isn’t advisable. It could get very expensive to fix as time goes on. Left untreated, rising damp will have severe consequences on your home and lifestyle. 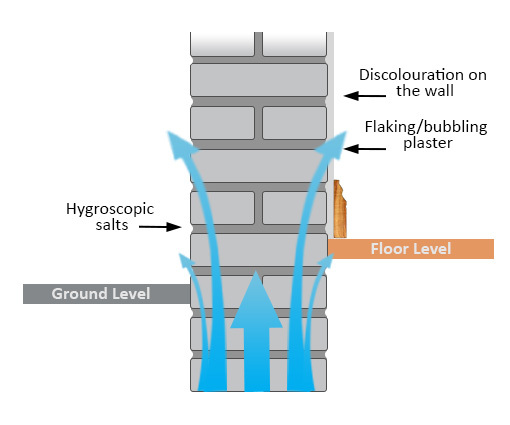 How Does Rising Damp Occur? Rising damp occurs as a result of ground moisture being soaked upwards into the walls of a building through the porous materials such as stone, brick and mortar. It develops if the “damp proof course” (DPC) in the wall is ineffective, damaged or non-existing. Dampness in the walls of your home will, over time, undermine the very structure itself. The longer you leave it, the more costly it can be to fix. Another good reason to remedy a rising damp situation quickly is to protect the health and wellbeing of your family - damp encourages toxic mould growth, which can have devastating affects on human health. Rising damp can also cause bad odours and can encourage infestation of pests such as termites and cockroaches. Our service includes a FREE rising damp assessment including specialist report (register below). We can also offer treatment solutions depending on the outcome of the inspection.